High up on a ledge of a marble quarry a sculpture waits to emerge from the rough walls that imprison it. Flesh and stone, sculptor and sculpture, dance around the question of who creates whom. Whom who inhabits occult in thy skin, thy flesh, thy bones, behind blinded eyes, behind unvirtuous hands, behind foul tongues and fading faces, I walk amongst ourselves… I am our Beast. "The ferryman" is a documentary on the place of the rite, the trance, the performance and the show in the world, with the creations of Damien Jalet, choreographer / performeur. 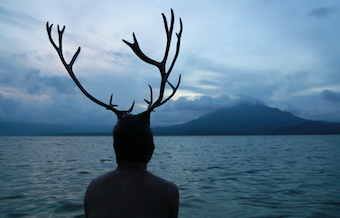 Through the way of the existence of a man-deer interpreted by Damien Jalet, we build parallels between time and places connecte in a cinematic space: In Bali, in Japan, in the Scotland, in Brussels, in the Louvre, in the opera of Paris, in Créteil.... This movie is a deification of the life and the nature which expresses itself in a profusion of rites, trances, and sculptures. Exploiting nature untill Fukushima. 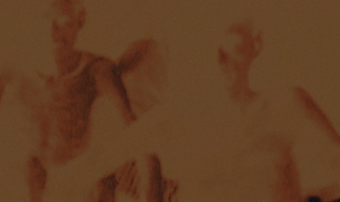 The section "Cinéma in Transgression" offers middle or feature lengh films out of norm and order, between fiction and documentary, characterised by complex audio-visual languages, unpredictable associations based on unconcient, metaphorical and metonymical proceedings. In this way these films can express the complexity of reality.